There’s no disputing the fact: seasonal food is best. Eating what’s in season, when it’s in season, is not only cheaper, but it’s also far tastier than other alternatives. So you’ll get extra flavour, extra crunch and extra juiciness in all your dishes. Stick to nature’s bounty and you’ll get the added benefit of nutrients tailor-made for the time of year. Here’s some advice from our chefs on what to eat and when. Pork is one of the most versatile types of meat; it’s economical, wonderfully tender if cooked correctly and oozing with flavour. High in protein, it’s an excellent source of iron, zinc and B vitamins and tastes wonderful too – so get some pork on your fork. A lamb is a sheep that is under one year old, and is known for its delicate flavour and tender flesh. The older a lamb, the deeper the colour of the meat, though the time it has been hung for and the breed that it comes from will also make a difference. Sorrel has a sharp, citric flavour – the name derives from the French for ‘sour’. Highly regarded in France where the leaves are used in soups and sauces, sorrel can also be served with fish and egg dishes. Only the younger leaves, available in the springtime, should be used in salads. No relation of the tuber-like Jerusalem artichoke, the globe artichoke is considered to be the ‘true’ artichoke and is the bud of a large member of the thistle family. The tender ends of the leaves and the base (or ‘heart’) of the bud are both edible. Radishes are the root of a member of the mustard family and have a peppery flavour with a crisp, crunchy texture. Among the most popular varieties are the small, cherry-sized common variety which has a red skin and white flesh. The untidy-looking purple sprouting broccoli is the colourful cousin of broccoli and can be used in much the same way. Leafier and deeper in colour than calabrese, it adds vibrancy and crunch to vegetable dishes. Purple sprouting broccoli is at its best between February and April, but broccoli is available all year and is equally delicious. Labour-intensive to grow, asparagus are the young shoots of a cultivated lily plant. They’re considered to be one of the delicacies of the vegetable world, with a price tag to match, and have a distinct, intense savoury flavour. The nectarine is a great choice at this time of year. It’s a smooth-skinned variety of peach, native to China, which is similarly flavoured to peaches but with slightly more acidity. The flesh is light pink, yellow or white and is delicate and sweet. Nectarines are high in vitamins A, B, and C, and are lower in calories than peaches. They’re at their peak from May to September. Botanically, rhubarb is a vegetable (it’s related to sorrel and dock) but its thick, fleshy stalks are treated as a fruit, despite their tart flavour. rhubarb, is grown outdoors, and arrives in spring. Its stalks are a deeper red, tinged with green, and its leaves a brighter green. It has a more intense flavour and a more robust texture than forced rhubarb. Mackerel is a firm-fleshed, torpedo-shaped sea fish. A whole mackerel is the perfect size for a meal for one in its un-filleted form. The fish has a distinctive iridescent skin with silver streaks and is well-known for falling into the ‘oily’ category, therefore is an excellent source of omega-3 fatty acids. A member of the mackerel family, tuna is mainly found in the world’s warmer oceans. They can grow to a huge size (up to 700kg) and their meaty flesh is distinctively flaky and firm with a rich, strong flavour, the consequence of its comparatively high oil content. type of fish or crustacean they come across. It is available year-round but more widely from March to September. 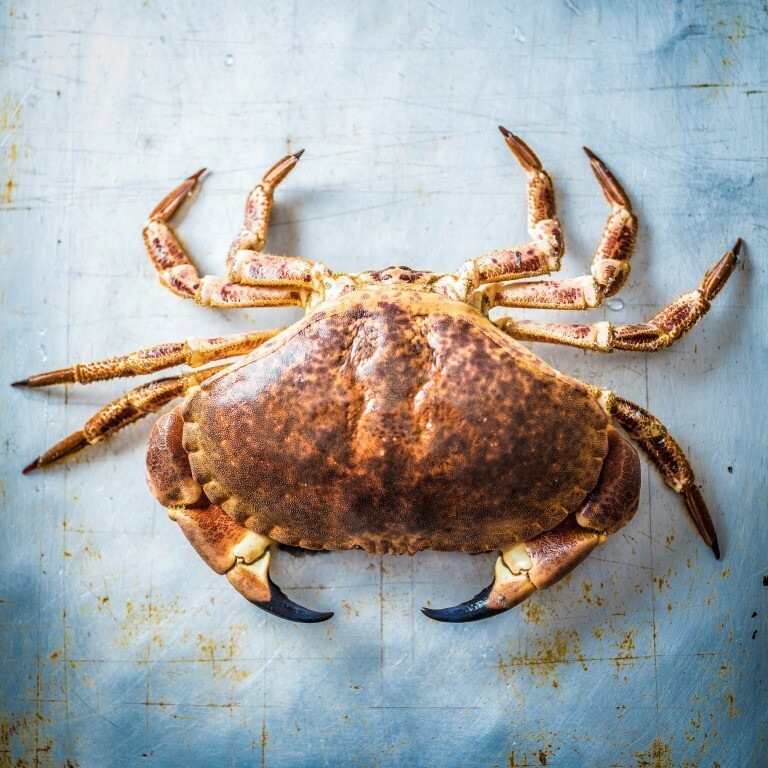 The most commonly eaten crab in the UK is the edible or brown crab that weighs up to three kilograms and contains plenty of sweet, succulent flesh. Female crabs have sweeter flesh than males. Crabs are generally in season from April until November.